Can’t do without it. Use it every day! For years I used the Liturgy of the Hours for my prayers. A friend introduced me to the Magnificat and I so appreciate how easy it is to use. What a wonderful prayer companion! I am unable to download. Finally!!! The new version is amazing!! I tried to work with the old app for years and finally gave up on it altogether. Then I recently discovered it had been updated so I gave it another try. Life changing! Thank you so much for the new app! It is beautiful and intuitive and I love having it at my fingertips all day long. Excellent app for an excellent product! I really love using this app. It works smoothly during Mass. In the last update the Marion Antiphons in Latin were removed. I wish the Latin Marion Antiphons were was added back in. Another feature I would love to see is the beginning words of each Eucharist prayer put back in to help guide the reader to the chosen Eucharistic prayer during Mass. To make it better it would be great if the beginning words for each Eucharistic prayer was a link you could touch that would bring you right to the beginning of the prayer. When trying to save the cover image to my phone, the app crashes. Otherwise, a well done app and nice digital version of my favorite prayer digest. I do wish the art review in the back was included. I found the cover art article, but not the other art commentary. Maybe it is there, but I can't find it. Everything else is top notch! I like the convenience of always having Magnificat with me. There’s no way I can leave it behind. The app works as intended and the small page size on the phone is no handicap, since the paper edition pages are also small. New software update is great improvement. Content as always is constantly better. The more I use the Magnificat the more I appreciate it. Artwork and organization is superb. Use it daily. You won’t regret it. Nothing to add really. 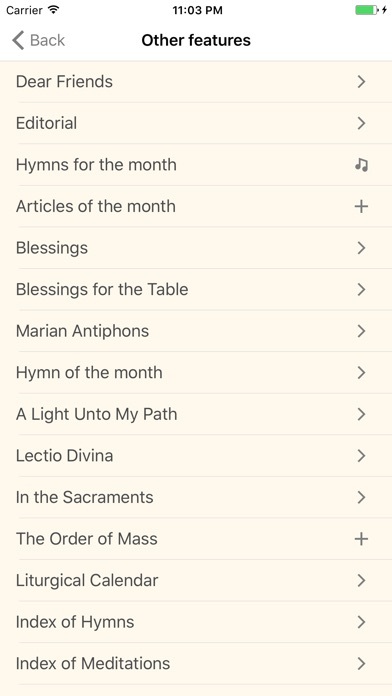 App works great as a backup if I forget the current months missal. Resizable text, copy and paste, new navigation and more make this a great update. They always had great content, now they have a great app too! I love reading the magnificent but the new update is too small to read on my iPad I just received an email saying there is 3 Font sizes in the settings, thank you guys from Magnificat!!! I have a new iPhone and received a message today that the current version of Magnificat will not work w IOS 11. I find the latest update to be great! Nice job on the update. I start my day with the Magnificat. Keep up the great work and God Bless. I like everything! Flawless. A pleasure to use. Get it now. The new app is terrible. It does not open on the proper day, nor does it go to the appropriate set of prayers! Please fix this! A great spiritual aid - technical problems in downloading. November 2018: unable to download on my iPad. Extremely frustrating. Fortunately I have it on my smart phone, but why can’t I get it on my iPad this month? Arrrrrgh! December 2013: again the app is not working w/o internet connection. Is this going to happen every month? Please fix this. Update: I love this app now that it can be accessed w/o Wifi. I have a written subscription but don't mind paying an extra $1.99 a month to help support this most important publication. C'mon, that is less than a cup of coffee in most places. Isn't spiritual food worth at least that much? It's great to be able to have the Magnificat with me wherever I go. Great job! * * * I love Magnificat mag and this app is just like having it on my Ipod. But it can only be accessed with wifi. No problem if you have an iPhone but pretty much useless on the iPod unless you want to replace the magazine and be content with just using it when you can access wifi which of course rules out church. This functional, well designed app is worth every penny. The Dominican Order is involved in producing this informative companion to daily mass readings. Extra features like monthly art essays, daily homilies, and saints lives (hagiography) and extra depth to the liturgical calendar. Wonderful devotional! Great art decoded! Reflections are faithful, varied, and challenging. The new update makes it sweet to use this app! I downloaded the new version to two different devices. On neither can I download the next month (September). It just keeps grinding away. I have tried restarting the device and deleting and redownloading the app. No luck. Now I'm stuck without the Magnificat that I've paid for. I contacted support, but have not received a response. UPDATE: In a couple of days an upgrade was issued that fixed the issue. I'm giving the CONTENTS 5 stars. Morning prayer and evening prayer are now the same. Please fix. God bless you! Version 5: what a relief! After three years, and months of warnings that the app would soon stop working, I am so happy to see the new version. The upgrade was rocky: it lost my login and I ended up having to delete and reinstall it (it also disappeared from the AppStore for two days). Visual design is very nice. Just a few nits: • split-hexagon background for buttons is distracting; • red text of "other features" button is garish; • download progress starts at 0% brightness which makes it impossible to see, and brightens to show progress; this is too clever by half as the arc and number are already doing so. Addendum: in the afternoon the main page shows tomorrow's date instead of today's (US/Pacific time). Thank you Magnificat! 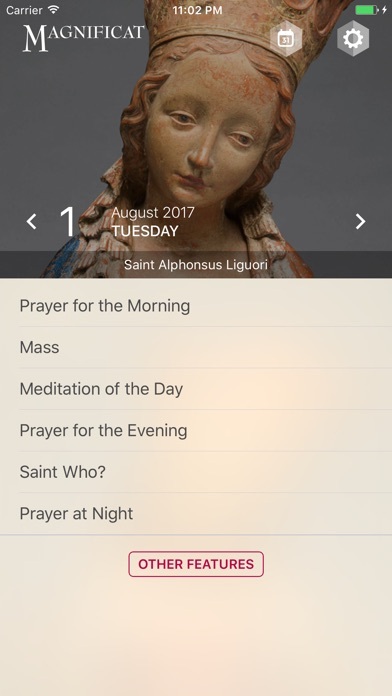 This beautiful app helps guide the faithful with daily Bible readings, reflections, and the knowledge of the sacrifices of saints and martys. I have personally seen how peaceful and happy the daily readers of Magnificat are because of their faith. Love the App. The new version is nice and I greatly enjoy the art each month. Previous reviews elucidated the ability to increase the size but I find the font still too small. Am I missing something? Thanks for the update of the app. Now it is really a great tool. The content as always blameless and awesome. Thanks! Good. Redesign is pretty well though out. However, for those of us with smaller screens and older eyes ... giving up space at the top of the screen for the Magnicicat heading is problematic. In earlier versions, it would disappear when the screen was tapped making the entire screen realestate available for the text for the Mass. Now, it persists. We really have enjoyed this for a year or two but since the upgrade we can't get it because the operating system we have is 9 something . We ask to download an older version that is compatible an it promptly gives notice that it is downloading, please wait. And we wait, and we wait, and we wait. It never stops. HELP I can get it at Magnificat online. Com,and the new scroll format is great, and it appears that is what this app might show. But we are still stuck with forever downloading. Except now it stops, says error downloading, touch to retry. Retried seven times, no luck, it would be nice to get it again on the iPad. HELP Thank you for solving the problem! The new format is great! Five stars now that we can use it again! I have updated to the latest version and I can’t download. Receive error message. 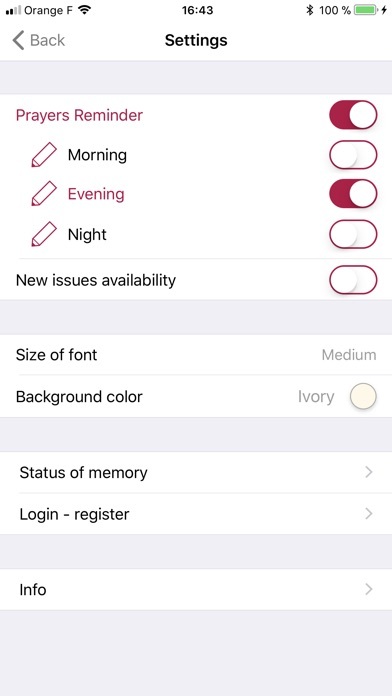 Can’t get into “Status of Memory” section. Have tried deleting and re-downloading to no avail. The app is unusable as it is. Please fix!!! I just updated the app on my iPhone 6 and my iPad. The newest update dated Nov. 4, 2017 will not download the newest edition on either device. I have completely closed the app on both devices, and deleted and reloaded and the problem persists. It indicates it is downloading and to "please wait" while the dot indicators appear to show it working. Then I get "Error loading. Touch to retry." I have tried to load it over wifi as well as using data on my phone to no avail. As of now, the app is completely useless as I cannot access my subscription from there. Developers, please get this fixed A.S.A.P. This is one of my most often used apps. The latest app will not download the current month. It hangs and then just says to retry but will never load. Version not working. Won’t download. Great app! Very useful to access your copy of the Magnificat if you do not have a paper copy with you. Useful to read during my morning commute or on a break at the office. App won't download latest edition. Keep trying but to no avail...Nothing. Help!!! The update is a drastic improvement over the previous version. The upgrade makes the app much more fluid and responsive. Love the seeing the artwork of the cover every time I open the app. Sometimes the morning prayer is repeated in the evening. Also, if you live in the central time zone, when you start evening prayer, it puts you in the next evening’s prayer. Be sure to correct it. The new version’s large print on iPad is rather small if you are older. Revision In November major canticles left out. Still no real large type. It's downloaded but says, please wait while loading. However there's no data usage while "downloading"
So, I like this new version, and though limited on time to write about all the improvements, one of the better is the ability to change the font size. The previous version you could “stretch” it open to make it larger, but then had to move the screen side to side to read the larger size. My only problem, and I sent an email to the feedback team a week ago, is when I tap on Evening Prayer, I keep getting the morning prayer for the day. I’ve tried deleting the app and reinstalling it, but that didn’t fix this issue. Was curious if anyone else is having the same problem? I sent a comment via the app on my phone but never heard back so reviewing the app in iTunes. The update has flaws. First, at 11:37 pm when I opened the app it took me to the next day. Apparently the app thought it had passed midnight however I'm on Central time and it had not passed midnight. Secondly, no matter which option you select from the daily menu, it always takes you to the top option "Prayer for the Morning." When I select "Prayer for the Evening" it still takes me to the morning prayer and I must page down to the section I want. In the scheme of wordly issues, none of this is a big deal but a nuisance. Sometimes new/updated is not always better. Love having Magnificat on the go! Every month, it’s a hassle to download: multiple false starts, “error loading” messages. I’m out. Prayer isn’t meant to be frustrating.